The Dodgers send LHP Hyun-Jin Ryu (5-7, 3.59 ERA) to the hill to face the Nats’ RHP Stephen Strasburg (13-4, 2.64 ERA). The Dodgers held Ryu out of his last scheduled start as they juggle six pitchers in the rotation. He pitched well in his last game, holding Arizona to one run in six innings. Strasburg is on a 34-inning scoreless streak. How has each pitcher done against the opponent? Strasburg has a 2.82 ERA in six career starts against the Dodgers and a 0.94 WHIP, allowing two earned runs or fewer in five of the starts. Ryu has made only one start against Washington, a loss when he allowed four runs in seven innings at home earlier this season. 1912 Casey Stengel of the Dodgers makes an impressive major league debut against the Pirates. The likable Brooklyn outfielder from Kansas City collects four hits, drives in two runs, and swipes a pair of bases. 1963 Dodger ace Sandy Koufax tosses a four-hitter, blanking St. Louis at Sportsman’s Park, 4-0. The southpaw’s scoreless effort establishes a National League record for shutouts thrown by lefties in a season with 11, five shy of Grover Cleveland Alexander’s major league mark set in 1916 with the Phillies. 1981 Dodgers southpaw Fernando Valenzuela ties White Sox freshman Ewell Russell’s 1913 rookie record when he hurls his eighth shutout of the season, blanking Atlanta on three hits. The 20 year-old Mexican’s 2-0 victory breaks the previous National League mark shared by Irving Young (Braves, 1905), Grover Cleveland Alexander (Phillies, 1911), and Jerry Koosman (Mets, 1968). 1996 Dodger right-hander Hideo Nomo no-hits the Rockies, 9-0, at Coor Field, becoming the only big league hurler to accomplish the feat in the thin air of Denver. Tornado Boy’s performance in Colorado is the best-attended no-no and is the only hitless game with a paid attendance of more than 50,000 fans. 2010 Joe Torre, who will compile a 2326-1997 (.538) managerial record during his 30 seasons as a skipper with the Mets, Braves, Cardinals, Yankees, and Dodgers, announces he will be retiring at the end of the month. Los Angeles immediately hires the team’s hitting coach Don Mattingly to replace the 70 year-old. 2014 Jason DeGrom strikes out the first eight batters he faces in the Mets’ 6-5 loss in Miami, tying the modern-day major league mark to start a game. The Amazins’ rookie right-hander now shares the record with Jim Deshaies, who struck out the first eight Dodgers he faced with the Astros in a 1986 contest. A whole lot of interesting things happened on this date in baseball history; take a look. Take THAT, Marlins and Mattingly! I missed this back when news first hit that the Marlins banned facial hair and Mattingly (he of the exceptional mustache when he played for the Yankees) agreed to enforce it, but the American Mustache Institute reacted with sorrow at that horrific turn of events. I share Dr. Causgrove’s dismay. 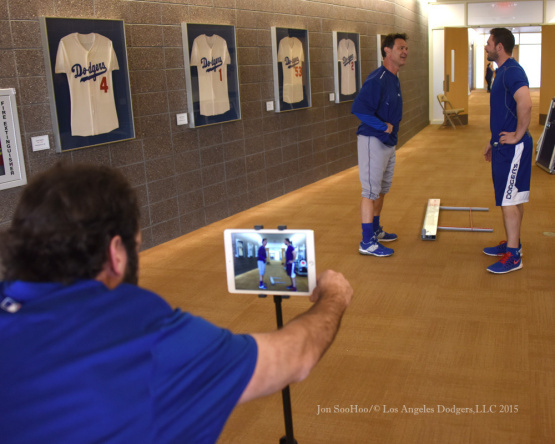 No new hire to replace Mattingly yet. I suspect (hope?) the Dodgers won’t step on the World Series by announcing a new manager in the midst of the games. Remember 2007 when Scott Boras announced that Alex Rodriguez, his client, was going to opt out of his contract with the Yankees in the middle of Game Four? Should the Dodgers keep Puig? Will they sign Greinke? Can Pederson find a hitting stroke? Who’s gonna play second base? Will Ryu, McCarthy and possibly Arroyo recover? Can Alex Wood become an effective pitcher? Will Bolsinger improve? Buster Olney of ESPN offers up seven things the Dodgers should do this off-season. On Puig: Olney reports that on the day Puig started in the series against the Mets he caught the last bus from the hotel, he didn’t start the stretch period with the rest of the team and he didn’t take as many cuts in the batting cage as usual. He thinks the Dodgers need to decide whether Yasiel’s “quirks” can be lived with and if so, they need to get the other players to learn to live with them too. Well, maybe. From what we’ve read in the media Puig does seem to have a little trouble with clocks, but he’s shown nothing to me that would indicate he’s not a team player. On clubhouse culture: He says some players felt “unsettled because for others besides Kershaw and Adrian Gonzalez and a handful of others, there was no sense about who might be headed out the door and who might arrive. Some players spoke about a diminished sense of investment in each other.” Olney then says the Giants, Cardinals and Pirates all exude mutual respect and esprit de corps, and the Dodgers don’t have it. Who’s to say? He’s certainly in a better position to know that than am I. I can certainly understand if some of the everyday players whose names no one but fans know might feel like they’re parts to be slotted in from day-to-day. If you’ve got an Insider account at ESPN you can read the whole thing. It’s a pitching rematch of last Saturday’s game featuring the Cards’ Michael Wacha versus the Dodgers’ Carlos Frias. Frias won the first game 5-1, going seven innings and giving up just that (unearned) run. Wacha gave up just three hits but four earned runs, including a three-run homer to Yasmani Grandal in the sixth which chased him. It was Wacha’s only loss of the season so far: he’s 7-1 with a 2.27 ERA. Frias is 4-2 with a 4.29 ERA. I think Vassegh co-hosts Dodger Talk on AM570 radio in LA. Jon Soo-Hoo is there with about 100 pictures per day. Nonetheless, I’d like to have been a fly on the wall to hear what Don and André are saying to one another. As if there weren’t some interesting prospects there, this may be sufficient reason for a road trip to Albuquerque to see the Isotopes. It’s the Phillies’ Kyle Kendrick, who is 0-1 with a 3.50 ERA, facing Dodgers right-hander Daren Haren, who is 3-0 with a 2.16 ERA. The Dodgers defense has been awful, as we’ve all seen. They’ve committed 22 errors in their first 22 games, which won’t cut it. First, we get the news that Matt Kemp will start in center field. Second, we learn that that was not the original plan, but that Mattingly changed the lineup to try to get the message across to Yasiel Puig that being late costs playing time. It’s Ryu v. Vogelsong at 1:10PM PST on SPNLA or in Northern California on CSN-BA. Due to a quirk in the schedule, this will be Ryu’s third start in five games, all on normal or better rest. Paul Maholm and Zack Greinke will start Saturday and Sunday for the Dodgers, while rehabbing right-hander Josh Beckett will pitch in a Minor League game Friday. Maholm was signed to be insurance if fifth starter Beckett wasn’t fully healed from thoracic outlet syndrome surgery. Beckett’s recovery, however, was complicated by a bruised right hand suffered in the clubhouse in Spring Training. This will be Maholm’s first start of the season. Beckett will pitch for Class A Advanced Rancho Cucamonga. Greinke, who pitched five innings for a win Tuesday, will be pitching on normal rest. Update: According to SI, “Puig thought he was supposed to be at the park at 10 AM PT, when he was actually supposed to be there in time for a stretch at 9:40 AM.” Okay, that’s a lot less annoying than I thought it might be. I was expecting that he’d underestimated traffic and hadn’t left his home on time, which in my world is unacceptable (I’m ten minutes early for everything). Anyway, the Dodgers’ Spring Training Camp in Arizona opens today for those two groups of players. The rest of the team arrives on Saturday. Here’s the official schedule. Chad Moriyama has several wonderful pictures at his place, including ones of the Dodgers’ spring training caps (!). Gotta maximize revenue opportunities, I guess, but specific caps for training camp? I’m preoccupied with a new dog, but I’ll start up the blog in earnest as the whole squad gets to Camelback Ranch, honest. Bonus Training Coverage: The Vatican (!) just released video of John Paul II taking batting practice from 1987 while on an American tour. This took place in California. Note: There’s some speculation as to whether that’s really Pope John Paul II, based on the English fluency of the hitter and the lack of interest the spectators are taking in his swings. Who knows? It’s a fun video. “The conversation went three hours and could easily have gone longer,” Colletti said. “We talked about our draft — he knew Seager. We asked him to go through our lineup, and he went through all of our hitters’ strengths and weaknesses. That’s kind of fun to know.